EURUSD: A Week for Recovery? In our last weekly analysis, we shared our expectation that the market will begin a massive downtrend, and we suggested that 1.0525 would mark the point of confirmation for this view. Since then the market plummeted for nearly 800 pips in an impressive, uninterrupted move the likes of which we haven’t seen in nearly two years. The market did reach our confirmation point, exceeded it by only 7 pips, and has been pausing there for a few days. This may be the last time that the euro has a chance to recover for a very, very long time. This main count sees that black wave (B) formed a contracting triangle labeled blue waves A through E, retracing exactly 23.6% of black wave (A). 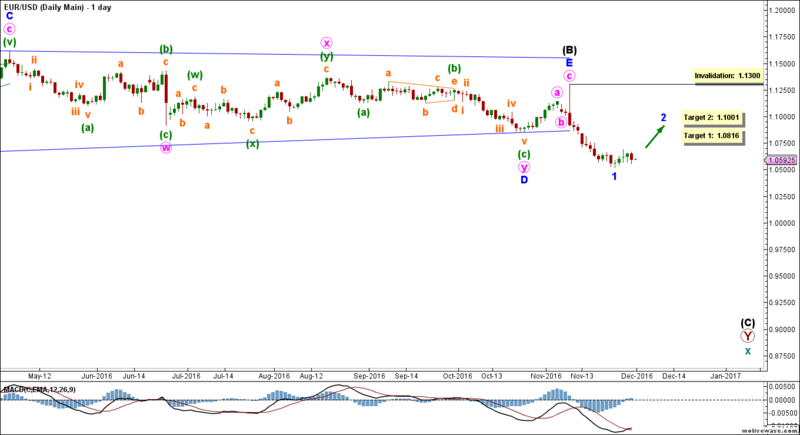 Within it, blue wave D formed a double zigzag labeled pink waves w, x and y, reaching 61.8% the length of blue wave B. Blue wave E formed a zigzag labeled minute waves a, b and c, retracing nearly 61.8% of blue wave D.
Within it, blue wave 1 is very likely complete. 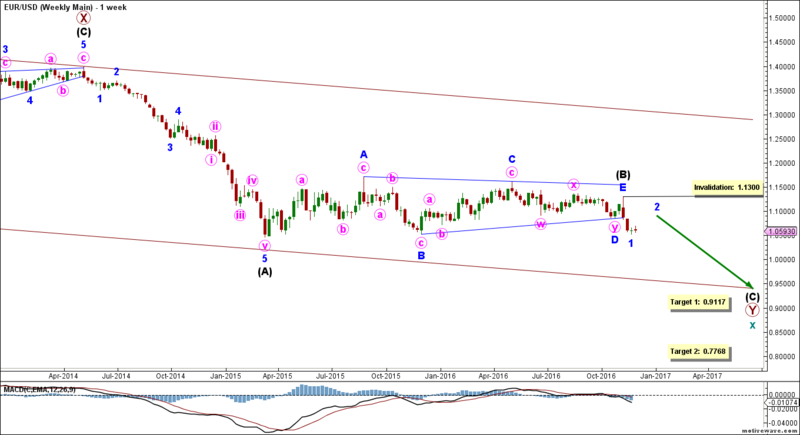 This count expects the euro to move towards the upside in blue wave 2. This is already the default count, and it will be further confirmed by movement above 1.0686. The MACD indicator supports this count by showing a bullish crossover, as well as the histogram bars moving above the zero line. At 1.0816 blue wave 2 would retrace 38.2% of blue wave 1, then at 1.1001 it would retrace 61.8% of its length.